Mogami Gold RCA-RCA Unbalanced Patch Cables are an excellent choice for audio, S/PDIF, and video signals. Designed for DJs and high-end consumer applications, this RCA patch cable features low loss, neutral tone, and Mogami's signature shielding for a dead-silent background. Excellent for professional audio home theater applications: an optimum choice to connect your HD Set Top Box or HD DVR (from your Cable TV or Satellite TV provider) to your HDTV or stereo. Use three cables for High Definition 1080i component video (Red/Green/Blue). Use two cables for stereo composite audio (Left/Right or Red/White). Use one cable for composite video (Y), S/PDIF, or mono audio (L). Equipped with dual gold contact RCA male plug connectors and wired with Mogami Unbalanced 75 Ohm Miniature Coaxial Audio/Video cable. 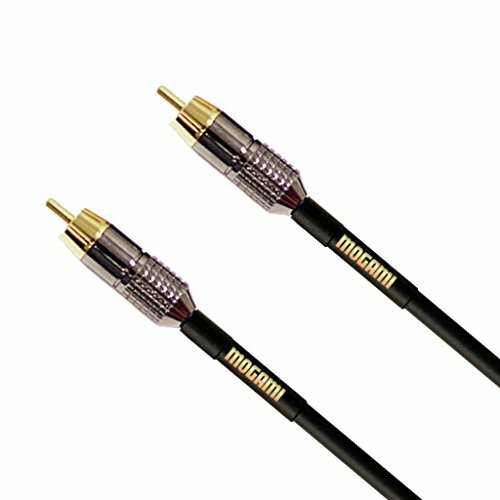 Mogami GOLD RCA-RCA Audio/Video Patch Cables are available in 3, 6, and 12 foot lengths. Mogami Lifetime "No Excuses" Warranty: all brand new Mogami cables include Mogami's Limited Lifetime "No Excuses" Warranty to the original purchaser and are proudly supported by Mogami and their dedicated network of Authorized Resellers. Please reference the entirety of Mogami Cable's Limited Lifetime "No Excuses" Warranty specification for complete details. Mogami Gold RCA-RCA Unbalanced Patch Cables are an excellent choice for audio, S/PDIF, and video signals. Designed for DJs and high-end consumer applications, this RCA patch cable features low loss, neutral tone, and Mogami's signature shielding for a dead-silent background. Excellent for professional audio home theater applications: an optimum choice to connect your HD Set Top Box or HD DVR (from your Cable TV or Satellite TV provider) to your HDTV or stereo. Use three cables for High Definition 1080i component video (Red/Green/Blue). Use two cables for stereo composite audio (Left/Right or Red/White). Use one cable for composite video (Y), S/PDIF, or mono audio (L). Equipped with dual gold contact RCA male plug connectors and wired with Mogami Unbalanced 75 Ohm Miniature Coaxial Audio/Video cable. This Mogami GOLD RCA-RCA-06 Unbalanced Patch Cable is a 6 foot length. The Mogami GOLD RCA-RCA Unbalanced Patch Cable series is also available in 3, 12, and 20 foot lengths.